If you like nothing better than pinging balls around a table, flipping flippers, and building highscores, then the numerous table options found in Zen Studios’ Pinball FX3 will be more than appealing. In fact, if you’re looking for any pinball experience, then it is the Zen offering which stands head and shoulders above the competition. But that doesn’t stop others trying to get a piece of the pinball pie and the introduction of Babylon 2055 Pinball to the market for a stupidly low price tag gives ‘balling fans a slightly different option away from the visual glories of the usual Marvel and Star Wars themed beauts. However, cheap doesn’t always mean cheerful and Babylon 2055 Pinball seriously struggles to even tie the laces of the big pinball gaming dogs. In fact, it struggles to even tie the laces of its own. 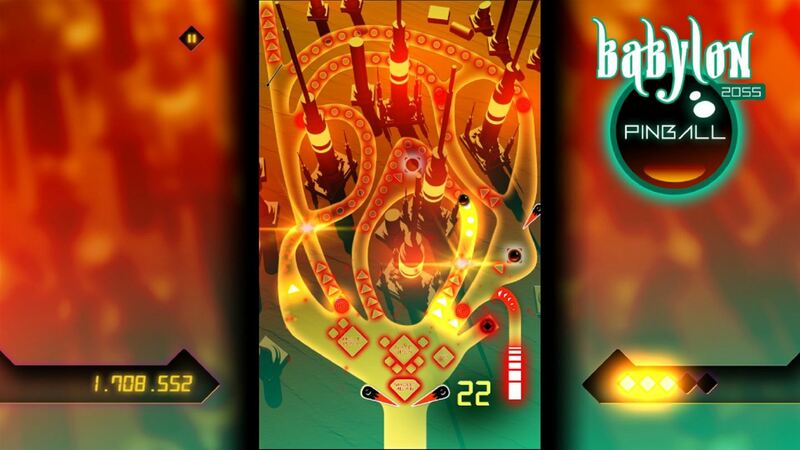 See, Babylon 2055 Pinball may look bright and beautiful, but it’s not particularly good fun. And games should be all about fun, should they not? Yes. Yes, they should, but Babylon 2055 Pinball falls short in a good number of aspects, no doubt struggling to enthuse any but the most hardened, most blinkered, pinball nut. And even then, I should suspect that they’d struggle to warrant spending too much of their precious highscore obtaining time with this ball slinger too. But why? Well, where should I start? I guess as good a place as any would be with the tables, for it be those which a pinball experience solely lies. With 6 standard tables in place, you could be mistaken for thinking that the amount of content included is just about right for a game that costs £3.99, but if truth be told, all 6 tables are hugely similar to one enough and offer very little in variety. So little in fact, that you’ll rarely know which table you are currently playing on. Nor will you really care. And in that I mean that they are all pretty damn boring to play through, with the minutest amounts of excitement, mini games or special features included to entice a gamer back. Yes, there are various avenues to shoot your balls, but my youngest could draw a pretty decent pinball table layout with little effort, and there are mid-table flippers present on a good few of them, allowing you to at least attempt to keep any ball high and dry, obtaining huge scores in the process. But the lanes that you’ll be attempting to hit are poorly placed, working as full loops with little in-between, which in turn ensures your ball is shot straight back to the abyss at the bottom of the table each time. Yes, I know that keeping a ball from dropping into the drain is the main aim of any pinball table, but the placement of both entry and exit of the lanes really does make this a game that suffers from utter flipper mashing more than anything else. It doesn’t help that on many of these, the open play area just above your flippers – you know, the place where you usually find a bit of time to allow for planning – is just too small and tightly packed, seeing it become super tricky to really get any decent action going. And then, when you somehow activate one of the 9 various mini-modes – the multiball system, the fog of war that envelops much of a table or the horrible ‘black lines’ that follow each ball around the table are the most common – this sees you given even less room for manoeuvre or time to react. Yes, the introduction of game changing moments just makes things even worse. There are very few kickers or bumpers included in any of these 6 tables either, and that means your high scores can only be put down to how well you shoot the lanes, and luck in to a special combo or multiball opportunity. Or how fast you can just bash those trigger buttons and hope for the best. Once you manage to find the time, or effort, to play through each table at least ten times, or at the very least ‘complete it’ – something which I’m at a loss to explain how as it just seems to happen randomly – you’ll find access opening up to the next in line. What do you do then? Well, it’s pretty much nothing short of rinse and repeat everything over and over again, aiming for highscores and the chance to best your mates on the global leaderboards. Whether you’ll get them or not is anyone’s guess, but the huge ‘mini-mode’ textual overlays which cover a good third of each table come those special moments, try their best to put you off even more. Alongside these tables however sits one more super-special option, and this is by far the most intriguing table of the lot. But that doesn’t say much for those running alongside it. Set out in the usual style, this sees a fully open table with a few flippers and multiple circular bumpers. There are no lanes to hit but instead slowly dropping down from the top of the table are space invaders style enemies. 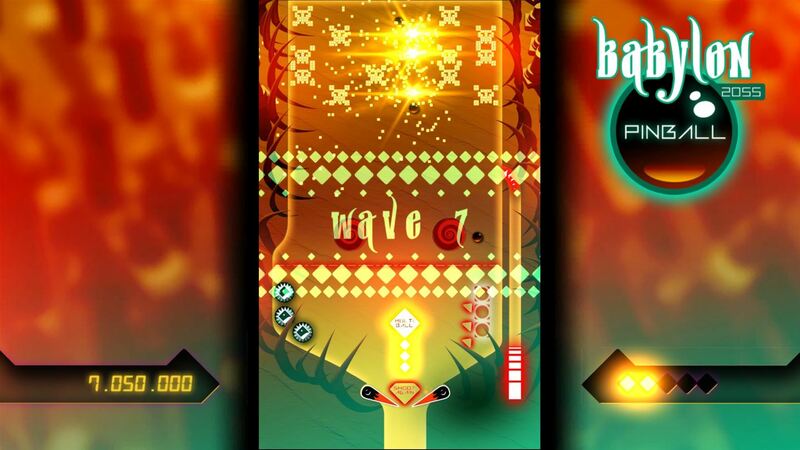 Your task is to ping the ball through them, taking out the advancing waves before they reach the bottom. In a complete and opposite twist to the rest of Babylon 2055 Pinball, this turns out to be hugely fun, and pretty damn addictive, saving the game from utterly destroying itself from the boredom found within. The problem is, this is just one table out of seven, and again, once you’ve mastered it – or at the very least played it a few times – you’ve got next to no reason to bother playing Babylon 2055 Pinball anymore. 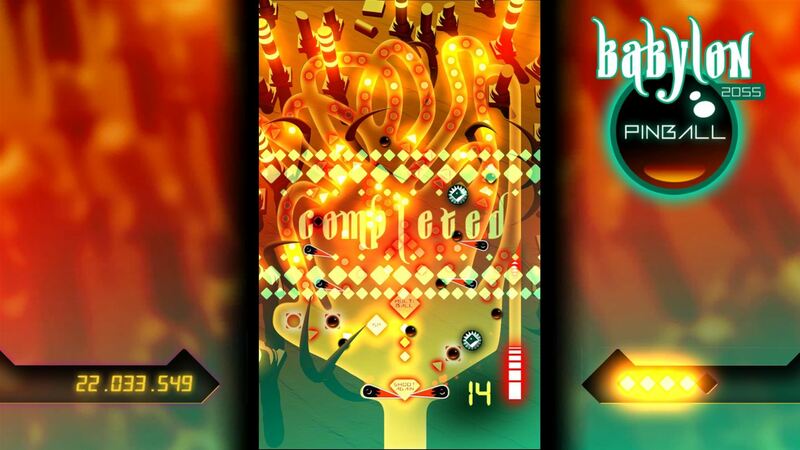 Aside from the gameplay and a little credit must go out to the development team at Shine Research for trying to create a bright and wonderful pinball experience. Full of glow, the action may be limited to the centre portion of your screen, but each table definitely brings a bit of a visual feel good factor. Strangely though, there is some lag and whilst the physics of the ball seems to just about work fine, at times we find the action stuttering along, increasing the difficulty as precision shots are left in the hands of the gods. It’s not all the time, but it is something that is a strange affliction to an otherwise basic game. It must also be said that in the complete opposite to the decent visuals, the audio is downright horrid. Basic gameplay sound effects are cool enough, with a whizz and a pop seeing things play out fine. But accompanying these is a soundtrack which constantly loops away in the background, drilling its way into your head, as it attempts to induce a migraine. You can switch it off, of course you can, but that in turn switches off every single sound effect at the same time. Playing in silence is nearly as bad as listening to the looping madness. Is it really too much to ask for a couple of toggles? And that my friends is Babylon 2055 in a nutshell. An old, very battered, nutshell. 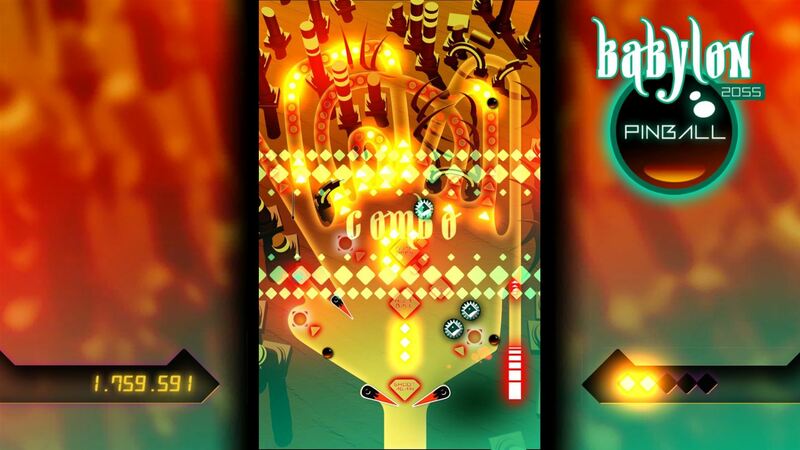 £3.99 isn’t much to pay for a game, even a pinball game, but what is included still has to turn out to be fun and Babylon 2055 Pinball is far removed from that. As if you couldn’t guess from the price point alone, Zen Studios have absolutely nothing to worry about with the addition of this game into the market. If anything, it just proves what a brilliant experience Pinball FX3 actually is.